Update: Next sales day is on 9th September and the registration for the same starts today 6 PM. As promised, Xiaomi Beefed up the stock to 40,000 units, but as expected the stock didn’t more than 5 seconds owing to the huge demand. Xiaomi Redmi 1S features a 4.7 Inch display with 1280 x 720 pixels powered by 1.6 GHz Snapdragon 400 quad core SoC. There is 1 GB of RAM and 8 GB of internal storage on board as well. The dual SIM handset features a very good 8 MP rear shooter and a 1.6 MP front camera capable of full HD and HD video recording. All hardware is powered by a removable 2400 mAh battery. This is a lot for an asking price of 5,999 INR. 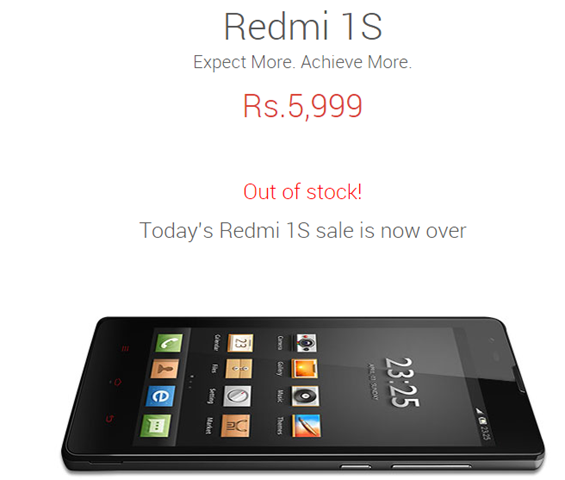 Xiaomi is also offering free Display protector with Redmi 1S purchase today. The Redmi 1S accessories will also be available starting today in India. As usual disgruntled Xiaomi Fans have taken to Social media channels to express their anger, while opportunist are posting adds to sell in black. Some customers even got their Redmi 1S order canceled even after successfully adding it to cart. Flipkart doesn’t detail the next sales day or when the registration for the same will be open. Last time this happened Mi3 sales got suspended. Will the next stock be delayed? Its too soon to say. To clear all your Xiaomi Redmi 1S queries, head on to Xiaomi Redmi 1S FAQs.